Today we've added two new privacy settings for your blogs: Private and Password-protected. Blogs on Write.as are unique for being simple, light, and a breeze to create. Each brings your writing together as one cohesive work, and can serve as an identity, a serial story, or just somewhere to organize thoughts. Back in October we launched public blogs to go along with our new community, read.write.as. But we know that for every writer that wants to reach a broad audience, there's one that wants to write quietly to themselves, or to an intimate group of people. Those writers could even be the same person; they just need to be able to choose how far their voice travels. Private blogs are visible only to the author. If you're not logged in, or are someone else entirely, you'll see that these blogs “aren't found.” This means your writing is truly private — no one but you can even confirm your blog exists. 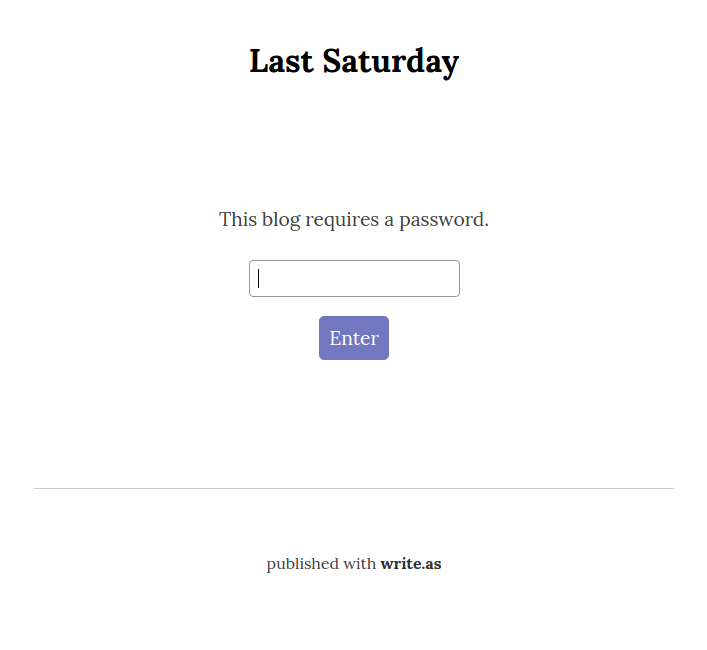 Password-protected blogs are only readable by those with the secret password that the author chooses. All visitors will see the blog name and description, but never the contents unless they enter the correct password. You'll see more improvements to password-protected blogs in the coming weeks as we improve the reading and signing-in experience. We're excited to see what you do with these new settings! As you use them, keep us in the loop with thoughts or ideas you have.